In a big event for friends of science in Greece, the Jane Goodall Roots & Shoots Greece is delighted to announce the visit of Dr. Jane Goodall to three Greek cities this December! Between 9th and 11th December 2018 the internationally renowned primatologist, ethologist, founder of the Jane Goodall Institute and United Nations Messenger of Peace will hold speeches in Thessaloniki, Athens and Heraklion (Crete). Jane Goodall is recognized as one of the most important scientists of our time. In 1960, her work in Tanzania on the behavior of chimpanzees rocked the world of the global scientific community. In this pioneering study, she was the first to prove that humans are not the only species that creates and uses tools, and that chimpanzees are sentient beings with the ability to express feelings and unique personalities. Thanks to her scientific research, she has changed the way we perceive humans and animals. In 1977, she founded the Jane Goodall Institute. To this day, this organization conducts scientific studies and develops innovations in the field that improve the living conditions of local populations in Africa. Dr. Goodall has also written dozens of books, both for children and adults, and has contributed to the creation of several National Geographic documentaries. She has received many honors, awards and positions during her career, the most important of which being United Nations Messenger of Peace and Dame of the British Empire. In 1991, while in Tanzania, Dr. Goodall developed and founded the Roots & Shoots program. This educational program supports young people from all over the world to help them become “leaders of change”. They are encouraged to take action and create projects that benefit animals, people and the environment. More than 150,000 groups of children and young people are now active around the world. 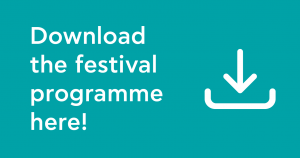 In 2016, the program was brought to Greece. Dr. Jane Goodall’s official office in Greece, Jane Goodall’s Roots & Shoots Greece, was founded in 2017 and operates as a non-profit organization. The Greek office offers several resources to the community including: 1) free seminars for teachers on experiential learning, 2) events that promote environmental justice and wildlife welfare/rights, and 3) scholarships to children and young people who designed and implemented projects through the Roots & Shoots program in Greece. 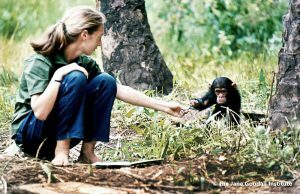 At the age of 84, Dr. Jane Goodall continues to travel 300 days a year, giving lectures on the environmental crisis, proclaiming the conviction and hope that the human species will ultimately solve the problems it has caused on the planet. Her speech titled “Jane Goodall: Reasons to Hope” will be held in English with simultaneous translation in Greek. This speech is for the general public, as well as scientists, teachers, students, adolescents and adults who want to meet her and be inspired by her work. 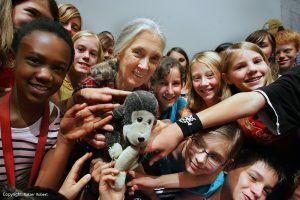 Dr Jane Goodall will also attend events at the American Community Schools Athens, Pinewood American International School (Thessaloniki), and the Natural History Museum of Crete-University of Crete. During these visits, students who have completed projects through of Jane Goodall’s Roots & Shoots program will be able to showcase their projects. These events are exclusive for students who have submitted a project. The program will be announced shortly by the partner schools and the museum. 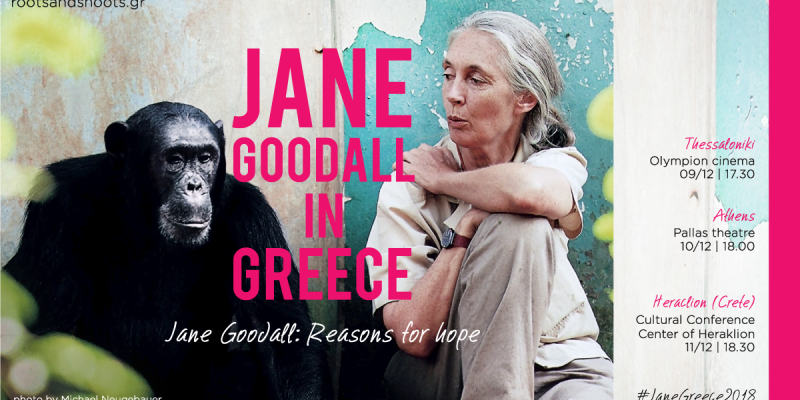 Dr Jane Goodall’s visit to Greece is an initiative of the non-profit organization Jane Goodall’s Roots & Shoots Greece and her lectures are organized in partnership with other institutions that embrace the vision, values and contributions of Dr. Jane Goodall. Attendance to all speeches is free and open to the public. The visit of Dr. Jane Goodall in Thessaloniki on December 9th is co- organized by Jane Goodall’s Roots & Shoots Greece, the Thessaloniki Film Festival and the British Council. Sponsor: Pinewood American International School. The visit of Dr. Jane Goodall in Athens on December 10th is co-organized by: Jane Goodall’s Roots & Shoots Greece, Save a Greek Stray, Pallas Theater, British Council, Science and Communication -SciCo. With the support of the British Embassy and sponsors of American Community Schools (ACS) and St George Lycabettus Hotel. The visit of Dr. Jane Goodall in Heraklion (Crete), on December 11th , is co- organized by Jane Goodall’s R & S Greece, the Natural History Museum of Crete – University of Crete and the Region of Crete, under the auspices of the University of Crete. Grand Sponsor: Aegean Airlines. Sponsor: Galaxy Hotel.